Women tend to apologize more than they need to for even the smallest of things, like bumping into someone on the street or asking for a minute of the boss' time. It's a topic that's been discussed at the annual 3 Percent Conference in the past, and a topic that Heat senior brand strategist Lauren Sooudi became interested in following one of the conferences. Sooudi got to thinking about all of the different issues women face working in ad agencies today and "how that relates to the work we do, how we interact and how we communicate with one another," she said. If women are going to been seen as equals in their agencies, she thought, Sooudi needed to know why women, including herself, were apologizing so much for trivial reasons. She started by looking at how women tend to over-apologize at work and found little data around the subject. 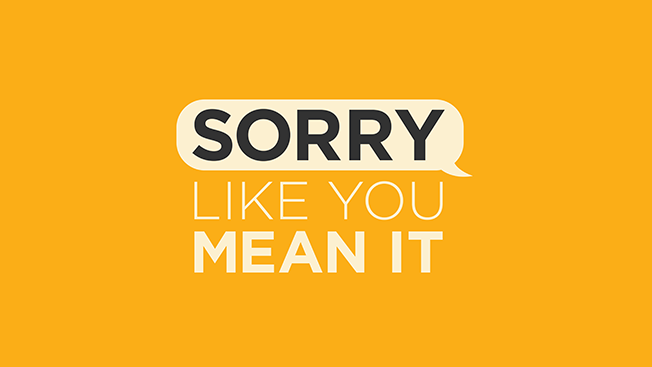 So, she decided to gather the data herself, putting together the "Sorry Like You Mean It" study to better understand why women over-apologize and what can be done to get women on a more equal playing field. "I knew it was something that was an issue for myself and I started thinking if I'm not aware of how I am behaving and how I choose my words, what impression am I giving everybody else?" Sooudi turned to third-party online research tool Ask Your Target Market to gather data from roughly 1,500 men and women between the ages of 18 and 65. While both men and women tend to apologize when they believe they are at fault, women exceed men by double digits when it comes to apologies related to empathy. Seventy-eight percent of women said they only apologize to be polite. Of those surveyed 55 percent said they apologize for using the bathroom, 52 percent do so when someone else invades their own space and 59 percent apologize when someone else is confused or unclear on something. When you break it down by job title, the results aren't much better. Twenty-nine percent of female executives and 31 percent of female juniors apologize five or more times a day, compared to 22 percent of male juniors and 20 percent of male execs. Sooudi found women tend to think that apologizing shows you value your relationship with that other person and not your own ego, while men only apologize when they make a mistake or are truly sorry for their actions. This, the study argues, takes power away from women in the workplace. "Hopefully we can have everyone in the office sort of pause and gut-check themselves and help one another be more accountable," she said. "Through this whole process I've become much more self aware instead of saying to my colleague, 'Sorry, can I have a minute of your time?' it will be, 'Excuse me, can I have a moment of your time?' It winds up making you feel more confident and more assertive, but still polite. Being polite and being assertive don't have to be mutually exclusive."